The law is based on facts, that pit bulls disproportionately bite at higher rates compared to other dogs. Discriminatory? maybe. Necessary? Definitely. In July 2005, about 6 months prior to San Francisco enacting a pit bull sterilization law, the San Francisco Chronicle reviewed hundreds of dog bites logged by the city. According to Animal Care and Control department records, pit bulls and their mixes accounted for 27% of reported dog bites since 2003, even though they accounted for only 6% of licensed dogs. Of the 900 bite incidents recorded in this period, 626 traced to a specific dog. Of those, 169 bites were attributed to pit bulls. As the Chronicle writer points out, "that's more than the number of bites by German shepherds (69), Labradors (58) and rottweilers (34) combined." Forbidden Foods For Dogs – Or Not? LinkAKC recently asked me to do an online Q & A interview – but they weren’t really able to fully use my answers. So I thought I’d give you the unredacted version! 1. Is it OK to give your dog beer occasionally? I’ve had a dog or two in my life that liked the taste of beer! Is letting her have a few sips in her bowl OK? Should we avoid it altogether? 2. I’ve heard/read that onions are poisonous to dogs. What should you do if onion falls on the floor and your dog eats it? Is a little OK? When should a dog parent be concerned that her dog ate too much of an onion? It is truly hard to envision a dog grabbing an onion and running off to munch it under a bush, but we do know there are dogs who will eat anything (just because they can?). Onions (whether raw, cooked, powdered or frozen) are toxic to dogs because they contain thiosulfate and organosulfur, both of which can lead to liver damage and other physical problems if eaten in any quantity. If your dog ate anything more than a small bit, it requires calling/seeing your vet or after hours calling an emergency animal hospital or the AKC Poison hotline (which does charge a consulting fee). 3. I’ve heard that eggs are good for my dog’s coat. Is it OK for me to give him eggs? Should they be cooked or raw? Does it matter? Is it REALLY good for his coat? Eggs are generally an inexpensive and excellent protein source for your dog – myself I feed scrambled eggs to my Weimaraners at least three times a week as part of their meals. Raw eggs are discouraged for people or dogs unless you have your own chickens producing them, but raw eggs don’t have any superior nutritional qualities anyway. Eggs are not more beneficial to a dog’s coat than any other protein – and it is a well-balanced diet with plenty of quality protein and quality fat that generates a beautiful coat. 4. My dog loves potato chips and popcorn. Is it OK to let her have a few when the humans in the house are eating these snacks? Is the salt bad for her? Once again you have the problem well known to potato chip eaters: I dare you to eat just one! Where your dog is concerned, one potato chip isn’t harmful (salt is an important element for all of us to consume in moderation) but there’s no way your dog isn’t going to beg for more (and more) once he gets a taste. Before long, you wind up giving a total of a big handful of potato chips it is not in your dog’s best interest. At that point it isn’t just the excessive salt on potato chips, but also the empty calories and the greasiness (hey, maybe a good idea to think about for yourself, too!) Popcorn, on the other hand, can be a really neutral snack – if you don’t salt it you’ve got a delightfully crunchy snack for your dog. But again, I’m relying on your self-control to do so in moderation. Having said that, when I make popcorn for myself (with a spoonful of olive oil in the microwave) my girl Maisie demands completely equitable sharing, so it has to be “one for me, one for her,” which means definitely avoiding the salt for both of us! 5. Most dogs love peanut butter and cheese. Are these foods safe to give my dog as a treat? These are delightful treats for your dog but really fattening. One fingerful is the right amount! People seem to think its okay to fill a whole Kong toy with squirtable cheese or peanut butter and give it to them to gnaw and lick out of the toy. In fact, it is too rich and too high in calories to be used as anything more than a tiny swipe. I actually eat peanut and almond butter on rice cakes for breakfast and my girls get to lick the knife afterward. It has about 1/8th teaspoon peanut butter on it, but they feel they’ve really scored big time! 6. Most people know that chocolate isn’t safe for their dogs. How much is too much? If she accidentally gets hold of (and eats!) a few pieces of chocolate, should I call the vet immediately? Some people seem determined to have chocolate in their lives and homes and dogs are “chocoholics” for the smell and taste, too. If your dog gets his teeth into high quality dark chocolate and more than just a small bit, you absolutely have to call your vet after hours or an ER vet clinic to tell them how much the dog ate and how big the dog is. They may tell you to wait and watch the dog for signs of illness, or they may tell you to come right in. The smaller the dog and/or the larger the amount of dark chocolate, the greater the chance of the dog needing medical intervention. However, if you are speaking about the chocolate in most prepared cakes and cookies and even what we think of as “candy bars” they actually contain little or no real chocolate or cacao, which is what doesn’t agree with dogs. 7. Finally, are there any signs a dog may exhibit if he eats food that is making him sick? What should a pet parent look out for if one suspects the dog ate something he shouldn’t have? Dogs are really good at throwing up when they eat something that disagrees with them – it must be an evolutionary survival mechanism since they seem to often hoover up the most amazing choice of items! If your dog’s stomach sounds like a washing machine and then her sides heave and she vomits, and then perks right up again, you’re lucky that she’s gotten rid of the offensive ingredient. When upchucking works effectively your dog clears her own system of the offending item and should bounce right back and seem like her normal self pretty quickly. But if the substance has entered her bloodstream or is causing harm internally, throwing up will not relieve her discomfort. When a dog’s system has been compromised by eating the wrong thing, she will usually act sick even after throwing up, or may throw up repeatedly. At that point waste no time in calling and going to your vet, who can do a variety of tests and then interventions to get your dog back in the pink. Thanks for the latest update. We are all staying positive. I am going to read some more on Bill 128. 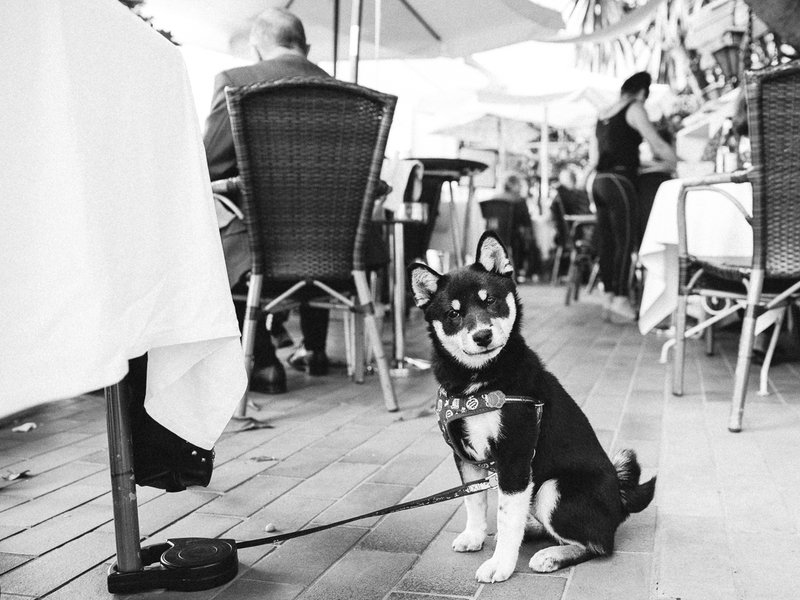 Micky, a 4 month old Shiba Inu, safely tethered whilst his owners enjoy lunch at Le Petit Port in Menton.